League of Legends exploded globally into the eSports scene last year, and with 2013, it sure looks like the rising phenomenon is not slowing down anytime soon. GPL 2013 has recently began merely in days into the new year, and as the official host/publisher of League of Legends (LoL) in Asia, Garena has announced yet another initiative to bring the game up another notch. In conjunction with LoL Season 3, Garena has began planning on one of the biggest Malaysian League of Legends tournaments this year around, particularly with up to a total of RM100,000 worth of prize pool. The tournaments will be broken down into two progressive seasons, first the Spring then the Summer (though Malaysia only has rain and sun lol), and finally leading to the Malaysian LoL Grand Finals. Plus, the winner of the Spring Season will additionally get a chance to immediately proceed into the LoL Season 3 regional qualifiers. The Spring Season will also be divided into two categories depending on how much guts or skills you have. Judge and consider yoruself a rookie, or as part of the 'King of the Hills'. Each game will be critical as you and your team will face a single elimination match format. But as you get excited about this, start forming your team if you don't have one yet, and get ready as the tournaments are set to commence in February. 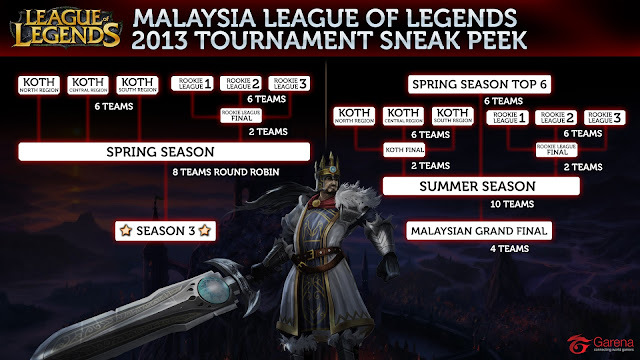 and here's a detailed tournament format sneak peeked by Garena.